What is the book REALLY about? Here is how you can pitch it to your friends! Want to know the inner workings of ISIS and their media machines? Perhaps you have a curiosity for Peshawar’s “terrorism factories” that turned out Jihadis for al-Qaeda and how they did it? Or perhaps you are curious about the inner workings of the House of Saud and what it has in common with Donald Trump and Jack Dorsey? Do you think Mecca, Saudi Arabia is the perfect place for terrorists to meet. Critically acclaimed filmmaker Parvez Sharma who is a veteran of death threats takes us into this and much more with his new book, A Sinner in Mecca. This book is the most current and real picture of the so- called “war” between Islam and the West. As one of the worlds best-known gay Muslims, Parvez has always fought hard to not be a casualty. Globally acclaimed gay and Muslim filmmaker living under the shadow of fatwas calling for his death goes to Saudi Arabia. On the way he manages to get deep into things like: Why did the Arab Spring turn into many Islamist winters; how does ISIS really work; What do Jack Dorsey, Donald Trump and Barack Obama really have in common and where do Hizbullah and the Iranians really get to hang. The world he reveals in Mecca, is one that has been hidden from most of humanity for 14 centuries. Rightfully, so. He knows exactly how to frame Islamophobia and the reasons for it. And he knows Jihad well; he lived it. No one is talking about Islam from this perspective. 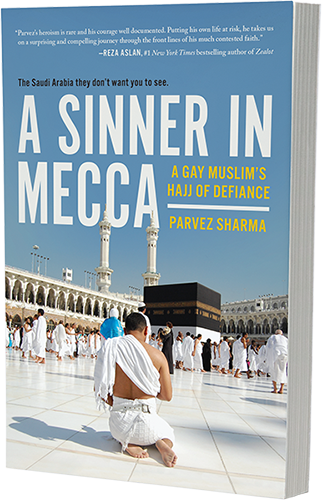 Parvez Sharma’s new book, A Sinner in Mecca takes off where his widely acclaimed film ended. This new journey unfolds with cinematic thriller like alacrity. Parvez takes us from Beirut to Mecca, from Cairo to Karachi and Tehran, from Peshawar where young men crushed by poverty are sold for “martyrdom” to Kashmir–one of the worlds most intractable problems to Kuala Lumpur that claims to have the keys to a progressive vision of Islam. If you think contemporary Islam has a few problems, Parvez has some real solutions–born not from being an armchair theorist but from two decades of battles in the trenches of his faith, with the shadow of hate in the form of fatwas or death-threats constantly hanging over his head. From Obama to Osama, from Trump to ISIS to the evils of the Saudi monarchy and the (Wahhabi) havoc they have caused in all Islam–this book connects dots in unprecedented fashion. Parvez’s odyssey is at once audacious, global, and remarkable. He meets everyone from extremists to explorers of the spiritual kind and the world they open up is frightening, yet breathtaking. Parvez provides an unflinching look at our troubling unfolding history, including taking us deep inside the workings of Hizbullah and ISIS and even inside the minds of real “jihadists.” An embattled Europe and America, Islamophobia in the West, and the destructive influence of Wahhabi Islam around the world get the same lived and deeply researched treatment. This is an author who knew what Jihad meant when he was five, growing up just down the road from the Islamic school that provided the doctrinal basis for the Taliban in addition to boys they had transformed into killing machines. Above all he makes the case that saying (as cable TV Muslim pundit/ Islam apologists often do) “Islam is a religion of peace” is farcical and untrue. While Parvez’s spiritual journey is a deeply peaceful one, the truth he offers is revelatory. PARVEZ SHARMA makes fearless, multiple award winning films about faith, identity, religious extremism and social justice. Two of the best known are, A Jihad for Love (8 million viewers) and A Sinner in Mecca, shot entirely guerrilla-style on a phone, changing the very rules of filmmaking. Parvez travels to Mecca to reveal a side of Islam that’s literally never been seen before. “We emerge from the film more enlightened,” writes The New York Times, naming it a Critics’ Pick. He has been hailed as a “gifted filmmaker,” (The Wall Street Journal) “frankly brave,” (NPR) “provocative” (San Francisco Chronicle) and as carrying out “an attack on Islam” by Ayatollah Khamenei’s regime in Iran. Parvez was named one of “50 Visionaries Who Are Changing Your World” in a list headed by the Dalai Lama. Parvez’s writings on Islamic, racial, and political issues have appeared on The Huffington Post, The Daily Beast, TheGuardian and elsewhere. He is a prominent speaker on Islam, politics, extremism, personal identity, and the media, having spoken at more than 200 live events around the world and conducting workshops with the United Nations, European Union, U.S. State Department, and the Department of Homeland Security. He reported actively about the “Green Movement” in Iran and about the revolution in Egypt, providing a local perspective on international events and an intimate view of history. The New York Times in a profile said, “After ‘Jihad,’ Mr. Sharma was labeled an infidel, and in the intervening years, he has gotten more death threats than he cares to recall.” The New Yorker said, “It (A Sinner in Mecca) was filmed mostly in secret, relying heavily on footage recorded during the hajj on Sharma’s iPhone” His new book, which shares the film’s title, is an unprecedented examination of the problems faced and caused by Islam, worldwide and unlike soundbite pundits on cable, Parvez gives real solutions. As a speaker, Parvez is represented by the Lavin Agency (http://bit.ly/2npO0uR).